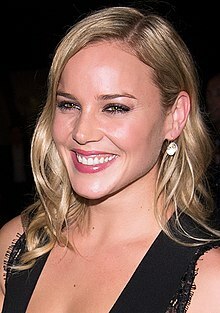 Abbie Cornish (born August 7, 1982) is an Australian actress who has performed in some notable movies. Cornish was born in New South Wales, and grew up on a farm. Her movies include Somersault, Candy and Bright Star. She played Emma Matisse in One Perfect Day. She plays Ellen Murphy in the 2014 remake of RoboCop. ↑ "Abbie Cornish Biography". TV Guide. Retrieved 29 November 2012. ↑ Mandell, Andrea (21 March 2011). "Abbie Cornish lives the fantasy". USA Today. Retrieved 22 May 2011. This page was last changed on 30 August 2017, at 19:58.